A few months ago there was spectacular news, although it only got a few lines in the newspapers. I didn’t write about it in this blog, because I thought everybody would already know. But last week I talked about it with a music collector, and to my surprise he had not heard about the recent breakthrough with phonautograph recordings! 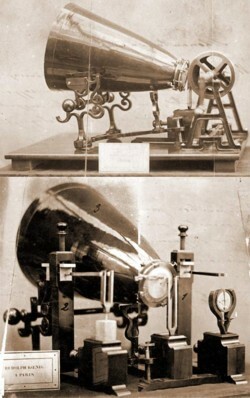 I don’t know much more about it than was told in the meanstream media: in 1857, that was 20 years before Edison used his tinfoil cylinder phonograph to record a sound that he could also play back, the Frenchman Leon Scott de Martinville invented a machine that could record sound in a way that a seismograph works. He called it a Phonautograph. The sounds were turned into graphs on paper, but these could not be reproduced. That is, until earlier this year scientists at the Lawrence Berkeley National Laboratory in Berkeley, California, managed to get sound out of Leon Scott’s phonautograms by using computers. You can find an article about this exciting news here. Pictures and lots of information about the phonautograph can be found here. I think that reproducing any form of recording data is in essence a form of time travel. Recordings are at least precursors of a time travel machine that can bring us to the past. Any picture, any movie or any audio recording IS the past, but of course only a tiny fragment of the past. It will take some time before we can record and reproduce time in such a way that we cannot tell it from the present when we re-live it. But in essence, whenever we watch or listen to recorded data, we time travel. The Phonautograph was invented by the French Typographer Édouard-Léon Scott de Martinville from Paris 1857. It is wrong that the phonautograph has anything to do with recording. It is the first device for making sound visible. It maybe could be the first Spectrograph (Anylysis). Greetings from Austria! You are right, Somebody, my explanation reads as if sound was recorded as sound in stead of as a graph.